Status report, Killowgg: Left in charge on the GL planet Mogo, he is faced with an increasing number of Lanterns on the injured/disabled list, while the Darkstar crisis continues to grow. 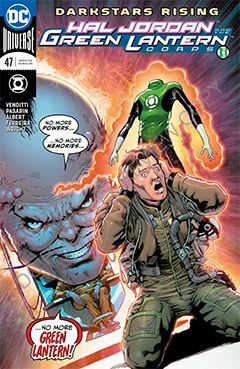 Status report, Hal Jordan: Having recruited Hector Hammond to the cause against the Darkstars, he has forgotten that he ever was a Green Lantern, thanks to Hammond’s treachery and a momentary lapse in judgement. Status report, Guy Gardner: Conscripted by the Darkstars, Guy is prepared to make his alcoholic father his first casualty. But not if Arkillo has anything to say about it. Yellow Lantern he may be, he still has a begrudging respect for Guy, and is prepared to sacrifice a great deal to reach his better nature. Status report, Kyle Raynor: Held by High Father, Guy has only a narrow window by which to escape. The question is, how long can Orion keep it open? Long enough for Space Cabbie to rescue the source of his livelihood? Status report, Simon Baz and Jessica Cruz: it’s like they’re not even GLs any more, as far as the Corps is concerned.